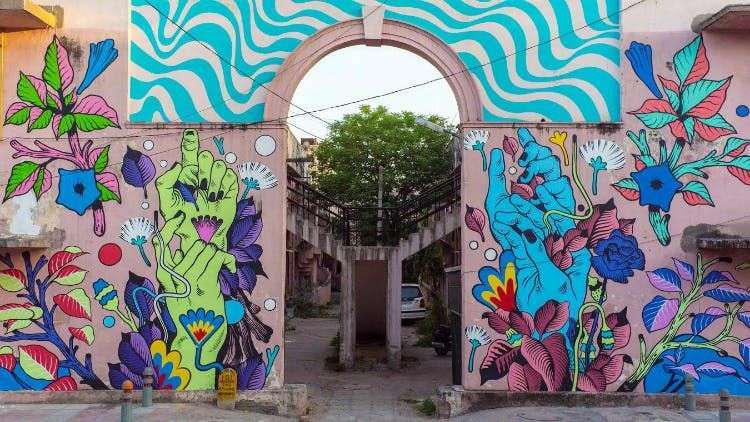 St+art India Foundation (St+art) presents Urban Art Festival – St+art Delhi 2019, supported by Asian Paints. This year, St+art Delhi 2019, will include, an expansion of the flagship project – (i) The Lodhi Art District with an addition of more than 20 new murals, (ii) an immersive art exhibition – F(r)iction at KONA, that will represent the discourse on the changing nature of the relationship between Art, Nature and Technology at Jor Bagh and, (iii) a special focus on increasing community participation at Lodhi Colony and surrounding areas. The festival will see participation from over 30 creators including artists, musicians, chefs and performers, and will run for 6 weeks until mid-march 2019. A true celebration of diversity, cultures and inclusivity, making art accessible to all. Lodhi Art District: An additional 20 new murals have been planned this year. The artists will produce their interpretation of social causes such as, women empowerment, climate change, waste and upcycling and various other pertinent issues. The festival will be made experiential through a focus on interactive media art pieces, which will explore the use of public space with emerging technologies. Visitors are encouraged to participate in artist-led workshops and curated tours for children and adults, in order to champion accessibility, there will be specially curated tours for the differently-abled. F(r)iction at KONA: An immersive walk-through multimedia artworks by national and international artists. The temporary exhibition will invite the public to dig into the complexities of our lives entangled in dichotomies and crosspollinations between technology, art and nature. Technology is changing our interactions with what all surrounds us, with nature, with ourselves within it as well as the viewership and creation of art. Thanks to technology also our definition of what art is made us capable of thinking about it in a more dynamic, open-minded way. It has also increased accessibility to art, making it no longer a realm of the elite. But does the desire of a captivating instagram picture dilute the reason of art to be? Urban Contemporary Art, St+art&#39;s domain, became popular majorly thanks to the social media power, F(r)iction is an occasion to present this movement and its dynamics while presenting different perspectives through the artists&#39; lenses. Site-specific installations, videos, interactive multimedia pieces and murals transform the venue of Kona – in Jor Bagh Market – in a parallel universe of frictions and fictions.